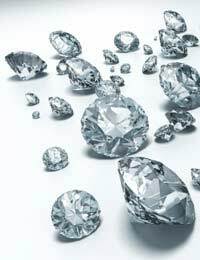 Home > Jewellery > Recognising a Precious Stone: Diamond Or Cubic Zirconium? Diamonds, they say, are a girl's best friend, and it's a definite fact that many women do love them. They're thought of perhaps as the ultimate jewel for engagement rings, fancy earrings, or simply something to show off. But a diamond isn't always a diamond. Cubic zirconia, or CZ, a man-made material that the Russians developed for use in their space programme several decades ago, has become the poor man's diamond. To the untrained eye it can be virtually impossible to tell the difference just by looking, and more than a few jewellers have been fooled by good zirconia. That means, of course, that it can be very easy for counterfeiters to pass off CZ as the real thing, and it happens with great regularity. If you're offered some jewellery that you're told is diamond, how can you really establish the difference between real or fake yourself? The price should give you a hint, of course; real diamonds won't be sold incredibly cheaply, unless they're stolen. Although the best way is to take the item to a jeweller for testing, there are a few things you can do to try and establish authenticity. The old rule that diamonds can cut and etch glass is perfectly true. However, in this case it won't serve as a test, because CZ is also hard enough to do the same thing. But you can try corundum sandpaper, which will scratch CZ but not diamond. Be warned, however, that if there's diamond in the sandpaper (and it does happen), then it will scratch and ruin even a real diamond. It can be difficult to tell with a small stone, but CZ is almost twice as heavy as diamond. CZ also tends to be completely colourless, whilst virtually all diamonds, except the most expensive, have a little colour to them. If you really want to examine properly, go and buy a jeweller's loupe, which is ideal for seeing a stone properly. With a real diamond you'll see tiny imperfections that are utterly natural. CZ, being man-made, will look flawless. A real diamond will break up light in a manner that's different from cubic zirconia, which means the diamond will look brighter. If the stone is loose, try placing it on a newspaper or something containing print. If you can read the words through the stone, then it's definitely not real. If it's in a ring or some other mount, then you should not be able to see through the stone it if it's a true diamond. When you put the stone in the light, a proper diamond will not give a rainbow-like reflection, but CZ will. To be fair, most people carrying out those tests might not be able to reach a conclusion, and that's perfectly understandable. All too often it's nigh on impossible to tell the difference short of having the stone professionally checked. But there is one test, perhaps the simplest of all, that can sort the diamond from the cubic zirconia. Simply breathe on it. If a sort of fog stays on the stone for a few seconds, it's CZ; real diamonds won't fog up. It’s funny, but CZ seems to have taken on a bit of cachet of its own these days and moved beyond the costume jewellery standard. A woman still wants a diamond for her engagement, of course, and her wedding ring. But if it’s just a present you can guarantee she’ll be happy with CZ – just don’t try to blag and say it’s a diamond or you’ll end up in trouble. If someone who's not a legitimate jeweller offers you a ring he claims to be a diamond, be very sceptical. Try the simple tests above, and if you're not sure, take it to a jeweller who can quickly tell you if it's a diamond or CZ. If it really is a diamond, be very suspicious as it's probably hot. Giving a woman a CZ ring and saying it's a diamond isn't a clever move - they can soon find out if it's real, too!